We are looking forward to meeting everyone who’ll try out on our next VAAS Auditions. But before the big day, kindly read the following reminders regarding what to bring, what to expect and how to better manage your expectations when trying out and joining the University of the Philippines Varsity Pep Squad. One of the most intimidating and shocking developments in Philippine collegiate cheerleading is funding. But please be reminded that as a special varsity team from the only government funded university in the UAAP, the UP Pep Squad does NOT OFFER FINANCIAL SUBSIDIES for being part of the team. You can look for your own private scholarships. However, put simply, we have no monetary offers. our service to the university is our way of giving back to our school and country. Idealistic as it may sound, successful applicants of the team are trained to serve the university, and not the other way around. So the UP Pep promise is actually purpose. Its rewarding work, it’s a golden struggle. We are looking for cheerleaders, performers, dancers and students who are willing to learn and willing to invest time to optimize their skills (with as much parental support as possible). Our team has always welcomed a wide range of skilled individuals. From gymnasts, to high school cheerleaders, hip hop dancers, b-boys and mere athletic potential. You may come from a different sport, or different dance genre. What’s most important is your commitment to TRAIN and IMPROVE. Please note that the VAAS Auditions are for those who did not qualify for the previous years’ UPCAT. If you are incoming UP DILIMAN Freshmen, and are interested in joining the team, please wait for further announcements regarding our summer training season. Other cases that are eligible for the program include college students from other schools who wish to transfer to UP Diliman, and senior high/ high school students who were not able to take the UPCAT. Kindly review the date, time and venue for the audition and be there earlier than the posted time, in proper athletic training attire (rubber shoes and hair accessories included). Bring hydration supplies for personal use, towels and extra shirts. Thank you, goodluck and see you there! Closing another training year, and another season of head aches, heart breaks, life lessons and great memories. But now that we are officially on break, we would like to recognize the efforts and service of our outgoing team members starting with our captains Cam, Lara, and brother Louie (3x) and ofcourse, our head drummers Angelo and Patrick! Thank you not only for your time, but more importantly for your presence. Thank you not only for your contributions, but more importantly for what you were willing to give up. Thank you not only for being our team mates, but more importantly for being people we can aspire to be like. When asked how do we measure the service we render for this state university, it is through people like you that we find genuine answers. Because ironically it is people like you who never ask for your service to be measured, or how much of what you have given up could ever be replaced. We also thank our outgoing senior members for teaching us the valuable lesson of what makes a mere memory and what makes a true respectable athlete. Whether you are getting ready for graduation or switching to full-academic mode, we congratulate you for surviving all the hell weeks that we hope from now on will come easier, dahil ok lang umasa. The past year has been very turbulent. …and that we all got back home safe. But in memory of all the individuals and events that have caused us a slight change in altitude and have brought us our share of inconvenience, we are reminded to be thankful for them. For reminding us to fasten our seatbelts and re-evaluate our values, our relationships and our commitments in life; for the chance to pray for stillness and for renewed appreciation of what we have, and the people we share these turbulence with. We dedicate our recent season to all of you, and with you, hope for even bigger ones. Elevision Concert, we would like to thank everyone who joined us last Saturday, as well as everyone who could not be there but still had something to do with the show. We wish our corporate sponsors and partners even more success. Hopefully in huge huge amounts, as we promise to speak positively of your brands and try our best to represent the ideas your company and our team share. We pray for better health, unfaltering safety and infinite patience for our friends, families and special “family-friends” who constantly forgive us for coming home late, losing our stuff, not eating properly, staying up all night, cramming, and forgetting to send our replies to your daily “san-k-n’s” and best wishes. We thank our fans, although it remains odd to acknowledge the fact that we have fans, and although more than half of them are probably blood-relatives as well. But to all of you, no matter how many or few, we thank you for your continuous patronage. Last Saturday’s show was a first for many of us, dreaded by some, and awaited by most. Our first attempt on a weekend concert, dedicated to all our friends who can’t come on weekdays almost backfired thanks to the many other events taking place that last weekend of February. Still, many people showed up, surprisingly filling the theater even during the evening show. Thank you for making an effort to watch our performance, joining us on stage and sharing your time and energy to make our show even more successful. More dreadful than losing an audience for ticket-sales, is losing eyes and ears to witness the vision each of us painstakingly prepared for. So again we thank every one who shared in this vision-mission-cheerdance-competition. To our Prof. Dan Silvestre and the UP Office for Initiatives in Culture and the Arts.To Director Mary Delia Tomacruz of the UP Theater and all its staff, especially to Kuya JR (Sotto) for all the handy works on stage. To our generous sponsors: Gold’s Gym,Smart, DMCI Homes, and Cabres Builders, Bayer, Teleperformance, PLDT Home DSL and Jollibee. For our costumes and apparel care of Hanes, Under Armor, Bianca’s Closet, and House of Dance. And once again to Indola, for our laborious fighting maroon hair. To our Production team headed by our Lighting Director and Choreographer Coach Peter Alcedo. Our choreographers: Sir(s) JM Cabling, Al Garcia and Sir Herbert Alvarez of the UP Dance Company, and Coach Sherwin Casepe. Our Coaches: Jon Cagas, NJ Antonio and Pio Opinaldo, RM Garcia and your 3-day express visit with hand-carried choreography, and the Doctors of Philippine Cheerleading — Doctors Brent Viray, Suyin Chua, and Amity Casurao, with the special participation of your family, Aaron Casurao and JD Trono (and perhaps soon, the rest of the Casurao Clan). And ofcourse to our one and only Prof. Ruben DF Defeo, for the inspiration, the guidance and the unending support, whether on stage, on cam, on video, on facebook and hopefully like before — on tour. To our ate’s and kuya’s — Carlou Guevarra, Monalyn Luna, Noellyn Figueroa, Tonsi Ignacio, Via Antonio, and Trixie Segundo, and ofcourse, Deo dela Cruz and Jens Mempin; and also those who came to watch us, knowing how they wanted to dance with us, too… the alumni members who have paved the way for making February’s throwbacks of deadly choreographies, backstage comedies, and warm memories. Soon we shall dance on your weddings, children’s birthdays, or maybe album and milk tea launches, too. And once again to all our supporters. You have always been part of this vision. so let’s just thank each of you for giving us a reason to see and believe. But until then, we urge everyone who has witnessed this past season to continue the fight for equality. The photo basically covers the key points. Date, time, requirements, etc. Again this is for UP Pep Squad Dancers. are already studying in UP Diliman. But for other questions, here’s a detailed explanation for the upcoming 2014 VAAS Auditions. March 1 and 2, 2014; 8am to 12 noon. 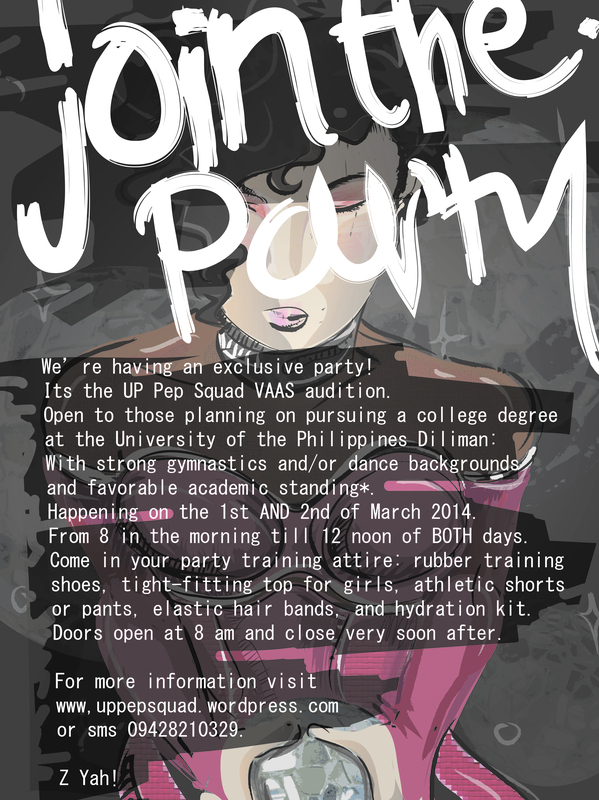 The UP Pep Squad VAAS Auditions will be held for TWO DAYS and all participants should be willing to come on BOTH DAYS. should make sure they are available on both days in case they will be asked to come back on the 2nd day. Strong background in gymnastics and/or dance. We are currently looking for students and athletes who are already trained in gymnastics, dance, or better yet, in both. Basic gymnastic skills are favorable, but excellent skills in dance will also be considered. More importantly, a waiver will be supplied on both days, and participants will not be asked to risk their safety or cause injury for the sake of recognition. The audition is for individuals who are generally eligible to enroll in the University of the Philippines Diliman campus ONLY. Preferably with good academic standing*. *For highschool/students who have taken the UPCAT, a grade of 2.9 or higher will be advantageous. For those who did NOT TAKE the UPCAT, a good academic standing in your previous school would suffice. We would like to note that the auditions are not exclusive to graduating highschool students. Students who have graduated from highschool from previous years, or with special academic cases are also invited to join, so long as you are between the age of 15 to 23 years old. This may include, but not limited to, transferees from other universities, home-schooled athletes, and students who are currently un-enrolled. For special cases, please contact the posted number. only up to the entrance venue but unfortunately we do not have a waiting area for non-participants. Rubber mats will be available during the event, but dont forget to bring your own hydration kit (water, sports drink) and (indoor) rubber soled shoes. Proper training clothes are required. From training shoes, socks, training pants (jazz pants, jogging pants, tights and sports shorts), tight fitting tops especially for girls, and some extra clothes and towels, as well as clips and bands for the hair. No need to wear accessories and bring jewelries ( i.e piercing accessories, rings, necklaces etc) and valuable gadgets. We would like to remind everyone that the UP Pep Squad does not give out any scholarships, tuition subsidies, loans, grants or any special financial rewards to its members or to those who will qualify in the auditions. There are also no promises of allowances for succesful candidates. We can only promise you a reputable training program, a chance to be part of a growing sport and many doors to many more opportunities and experiences that the University of the Philippines is truly proud of. Such is the life especially of student-cheerleaders in the University of the Philippines. We know that many young athletes would also like to take a chance in UP but are moved to take other opportunities due to financial concerns. We apologize for our lack of funds to cater to these individuals. However, we hope that this does not stop you from trying other means such as looking for privately funded scholarships, government aids or loan-granting organizations such as this one, co-founded by one of our alumni members. For anything else not mentioned here, please contact the number provided or any of the UP Pep RESIDENT MEMBERS on your social networks. Thank you so much and see you there! A very very happy new year, and slightly delayed greeting, to everyone! as we wont be having our UP Pep concert this year. so many tasks at hand, its no surprise its the year of the horse. But thankfully, looking back at 2013, we have garnered enough horse power to boost us this 2014.
with an epic Cheerleading Worlds Championship. But still, 2013 wasn’t all about competitions. the year 2013 is nothing short of a miracle. And a miracle it was indeed. Not only for the squad but the rest of the country. 2013 had our eyes crying. More than in cheerdance competitions, we watched as people get hurt. And more than trophies, so much of the really important things have been lost. It may be true that we will always remember the devastation more than we will remember our small victories. But opening our eyes and realizing that a year has already past, 2014 is now on a run, is enough reason to believe that we have endured. So we take pride in this show of endurance. We take pride in whatever little we have left and in how we can, again, let them grow into so much more. We take pride in being surrounded by people who teach us our worth and still remind us that what we go through, despite its share of tears, is nothing close to what others will have to deal with. And with this pride we are grateful. For the training to become champions and the experiences to deal with failures. opportunities to learn, to fight, to grow, and to share. One could only fight and push harder and maybe, say that this new year is going to be a better one. But we will never be sure of what 2014 will bring. The good and the bad of it will always come as a surprise. more difficult each year, it is clear that we will again face another busy, maybe busier, year. As tides change, we will have to be smarter. People will come and go, and we will just have to adjust. As the ground shakes beneath us, we will have to run faster. And if we run out of places to stand on, then we will have, atleast try, to learn to fly. There will be blood. And that we will endure. That’s what were grateful to have learned in 2013. And to everyone who has survived this past year, cheers to you too! And to everyone who’ll continue to join us this new year… more cheers coming UP!